For much of his adult life, Archbishop Joseph W. Tobin has lived and built deep relationships with many members of the Congregation of the Most Holy Redeemer, commonly known as the Redemptorists. Many of those Redemptorists made their way from around the world to Indianapolis on Dec. 3 for the installation Mass of Archbishop Tobin. Archbishop Tobin became a Redemptorist novice in 1972, first professed vows in the order the following year and was ordained a priest in 1978. In 1997, he was elected as the superior general of the worldwide order and served in Rome in that position until 2009. The following year, Pope Benedict XVI appointed him as secretary for the Vatican’s Congregation for Institutes of Consecrated Life and Societies of Apostolic Life, which helps guide the life and ministry of more than 1 million men and women religious around the world. 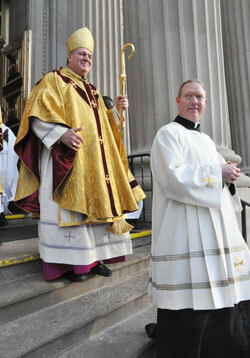 By virtue of that appointment, Archbishop Tobin was ordained an archbishop. Long before rising to such positions of leadership in the Church, however, Redemptorist Father Harry Grile met Archbishop Tobin when he was a “short, rather rotund little kid from Detroit” who, while a junior high school student, participated in a Redemptorist vocation program during the summer at a minor seminary the order operated in the mid-1960s in Wisconsin. “He did cannon balls off of the diving board of our swimming pool,” said Father Harry with a laugh. Father Harry later taught Church history to Archbishop Tobin at the now-closed Mount St. Alphonsus Seminary in Esopus, N.Y.
Redemptorist Father John Schmidt, also a leader in the Denver Province, served as an associate pastor of St. Alphonsus Parish in Chicago in the early 1990s when Archbishop Tobin was pastor of the parish. Watching Archbishop Tobin during the installation Mass, he recognized many qualities in him that he came to know 20 years ago. He also expected the charism of the Redemptorists to influence the ministry of Archbishop Tobin in the Church in central and southern Indiana and beyond. Archbishop Tobin is currently the only Redemptorist serving as a bishop in the United States. Father John said that the last one to do so was Bishop Aloysius J. Willinger, who served as the bishop of Monterey, Calif., from 1953 to 1967 and died in 1973. Also representing the Redemptorists at the installation Mass were young members of the order still in formation. Redemptorist Brothers Landon Cao, 30, and Aaron Meszaros, 27, are about a year away from being ordained priests. They are currently receiving their priestly formation at Chicago Theological Union in Chicago. Brother Aaron lived with Archbishop Tobin for about a month in 2007 when he was a novice in the order. He said participating in the installation Mass was a moving experience. Brother Landon, whose parents emigrated to the United States from Vietnam, sees Archbishop Tobin as a role model. Brother Aaron echoed Brother Landon’s sentiments.